I never thought I’d come to speak enthusiastically about sweatshirts this much! I visited Standard & Strange in Oakland, CA, initially interested in purchasing the restocked Red Wing 2966 Black Klondike Engineer Boots. Brandon (who is now with 3sixteen!) was very patient with me and helped me select out a Real McCoy’s Joe McCoy Ball Park Crewneck Sweatshirt in Navy. S&S is a stockist in the USA that carries a great selection of RMCs. The Real McCoy’s sweats along with their other pieces have the reputation of being the best of the best. In this post, I’ll give some of my thoughts about the Ball Park Crewneck and compare it to the few other brand sweatshirts that I own. The crewneck sweatshirt is a classic piece in American history. Naturally, the design comes from sportswear for the sweatshirt was used as an alternative to itchy football jerseys. The grey sweat has been worn by many American icons such as John F. Kennedy, Elvis Presley, the Beatles, Steve McQueen, and many more. I’d even go as far to say that it’s as famous as the Blue Oxford cloth button down shirt in American history. Added information from Standard and Strange: The main difference between a sinker weave and a loopwheel is that the sinker weave has more needles and knits at a higher tension. Sinker weave knitting machines are still slow and expensive, but not as slow and expensive as a loopwheel machine. Loopwheel knits stretch out a lot, then shrink back down with a wash, similar to raw denim. Standard and Strange suggests that if you purchase an item made from a loopwheel machine, that you have it fit more snug as it will stretch out over time. My budget, readily available sweatshirt option. I’d say this is the best you can get at this price range. The body length is notoriously short. *Uniqlo often changes their fabric composition and thickness every season (Sometime the blend can be more polyester than cotton – you just have to be sure to read the material tag label). Reigning Champ is made in Canada, and they’re nicknamed the “king of fleece”. Their Midweight French Terry Cotton is a year-round soft fabric and is woven in a way that one side feels like a soft cotton towel (interior) while the other is smooth (exterior). The purpose of the looped side is so that sweat can be easily absorbed. The midweight is a year round option for mildly cooler places like San Francisco, but likely won’t be warm enough for winter. While the price from a $20 Uniqlo sweatshirt to a $120 RC is quite large, I think RC is the best bang for the buck. The midweight french terry cotton isn’t too thick/warm, so it’s great here in California. Reigning Champ also has side gussets beneath the underarm that extend nearly all the way down the body. This extra feature provides comfortable mobility with your arms, while also maintaining a slim fit that is usually not seen with sweatshirts. Reigning Champ also stocks a heavyweight, tiger terry, and tiger fleece versions of their sweatshirts. 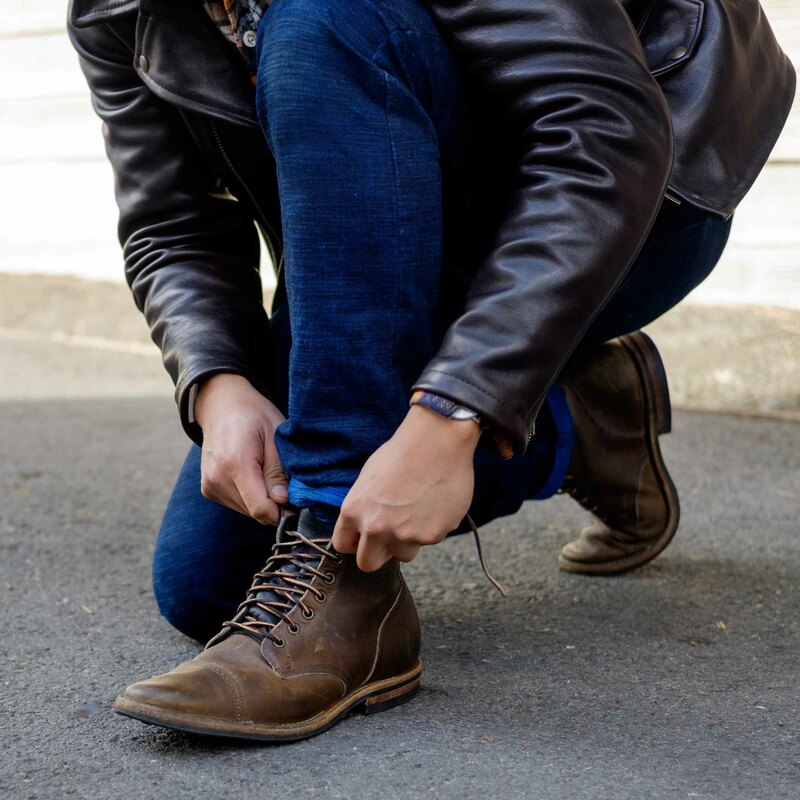 The heavyweight comes in at 500gsm (their midweight is 400gsm), has a courser feel against the skin from the start and softens/molds to you after many wears like a pair of raw denim. It fits slimmer than the midweight so you will likely have to size up one from your normal size. The sinker weave neither stretches nor shrinks (with a cold wash) very much and provides a more stable fabric. The interior fabric is somewhat courser than the Reigning Champ French Terry Cotton, but I still find it to be quite soft and comfortable for a sweatshirt. The Real McCoys states that this their heaviest sweatshirt fabric (at 12oz), but they do also have a ligher weight version at 10oz. The fit is boxier than Reigning Champs’s fit. The ribbing on the sweatshirt is very thick and doesn’t stretch easily. I also like the V-placket detail on this sweatshirt because it works better to maintain the collar shape than the Uniqlo’s. This sweatshirt is tubular knitted but not loopwheeled. A common misconception is that a tubular constructed fabric makes it loopwheeled. 3sixteen’s fabric is a heavyweight 500gsm fleece from Canada. It’s very warm and has two hidden hand pockets on the front like a hoodie. The pockets do not connect with each other, however. The interior is fleece. The fabric is a hefty 15oz cotton. The interior fleece was quite fluffy and soft initially, but after the first cold wash and hang dry, the softness has never quite returned. Some of the fleece shed off after, but eventually stopped. 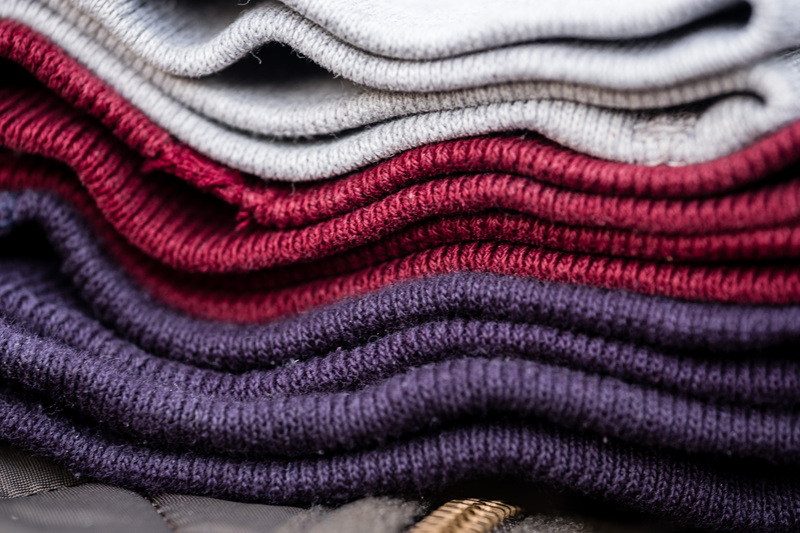 The neck opening is wider than the other sweatshirts and stretches easily. Filson luggage tag in Tin Cloth. The top one has at least a year of use while the bottom one is essentially brand new. In the past few years, Filson has expanded their use of their more than 100-year-old “Tin Cloth” to their bags (which originally used rugged twill). Tin cloth is a waxed canvas nicknamed “tin” by the forest workers. They they felt the garments were like armor protecting them from the harsh rain, wind, and brushes during the Klondike Gold Rush. Filson Tri Fold Wallet. When the tin cloth is brand new (or freshly waxed), it is very dark and looks “wet”. Filson’s original line of luggage used 22oz rugged twill as the primary exterior material. And while many bags from that line still utilize the twill, Filson has released newly designed bags that have integrated their renowned Tin Cloth into their construction. Some bags use a combination of both materials such as my Photographer’s Backpack, while other bags use solely Tin Cloth. Filson Photographer’s Backpack (same outer design as the Journeyman Backpack) uses a combination of tin cloth and rugged twill. I really like the designs of the newer bags such as the 24 hour briefcase and the 48 hour duffle bag. Another change I’ve noticed with these bags is that they use a Nylon Webbed Shoulder Strap instead of the Bridle Leather Shoulder Strap. The nylon strap seems lighter in weight and appears to distribute the weight over a larger area. I haven’t tried out the nylon strap, but I prefer the look of the bridle leather strap! If you are in the market for one of Filsons Tin Cloth bags, it would be beneficial for you to know some of the key differences between the Tin Cloth and Rugged Twill. If you already have one of Filson’s rugged twill bags, the interior seams should be bound with Tin Cloth for durability. You will likely see that the tin cloth seams have darkened/patina faster than the twill around it. Tin cloth bound seams for extra durability. Tin cloth seems to darken (or patina) easily. I speculate that the waxed finish helps attract dirt to its surface. The change in color on Tan tin cloth is more distinct than on the Otter Green tin cloth. In addition, rewaxing tin cloth with Filson’s Original’s Wax Finish darkens the material even more. The color will lighten up slightly again when the wax wears off. Tin Cloth is most well-known in the Filsons’s Tan color, while Otter Green comes as a second. Occasionally, black or navy tin cloth is used on bags/outerwear, and I suspect these colors won’t show dirt as easily. Here’s are some older pics of my Levi’s x Filson Oil Finish Tin Cloth Trucker that was a limited release in 2011/2012. Filson recommends a stiff bristled brush to clean the material and spot cleaning. Tin Cloth should not be put in the washer. Personally, I take a damp rag and wipe the areas down. The Tin Cloth that Filson uses is 15oz compared to Barbour’s waxed cotton jackets which is 6oz or less. Between the two, Barbour’s jackets are soft, while Filson’s Tin Cloth jackets remain quite stiff throughout its lifetime. While Tin Cloth repels water better than the rugged twill, the fabric is very unbreathable because it is tightly woven. If you’re wearing an unlined jacket with this material, expect to be soaked with your own sweat! Barbour’s outerwear typically comes with a cotton lining to help with this. 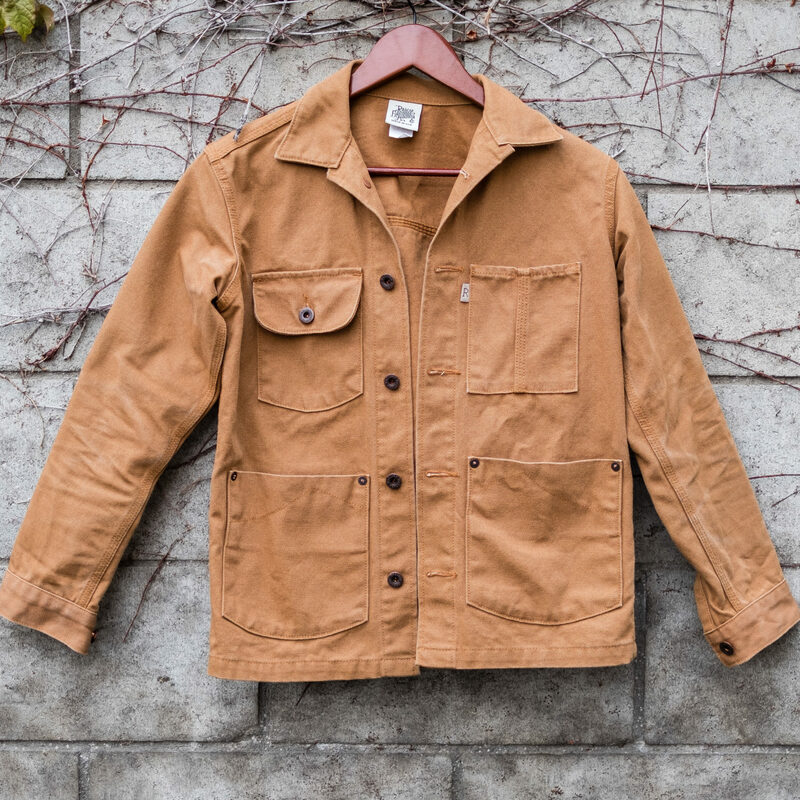 Unlined tin cloth on the Filson x Levi’s Trucker jacket. Notice the color difference between the waxed exterior and unwaxed interior! 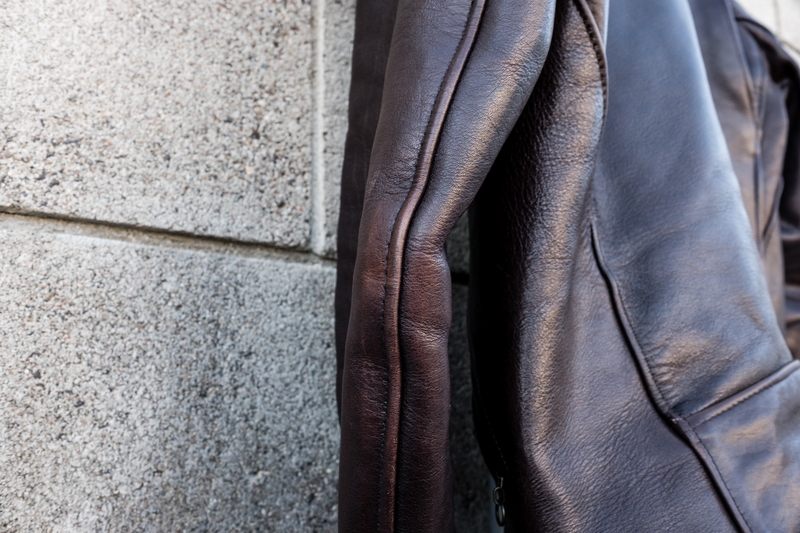 Tin cloth is an older formula than Filson’s rugged twill because it was used on their garments first. The extra water resilience that the fabric has requires periodic rewaxing to maintain it. I suppose if you want the best of both worlds, you can take Filson’s Oil Finish Original Wax and apply it on a rugged twill bag. You’ll likely need more than one tin worth to cover the whole bag. In doing so, you get the water repellancy from the original wax and also the thickness of the twill. To prevent fraying or reduce additional fraying on my older Filson twill bags, I have taken a dab of the wax and apply it on the areas that receive the most wear (typically the bottom edges of the bag). Pockets on a Filson Sportsman Bag likely made of unwaxed tin cloth. Keep a close eye and be sure to rewax highly creased areas like this one. Tin cloth backpack shoulder straps darkening. 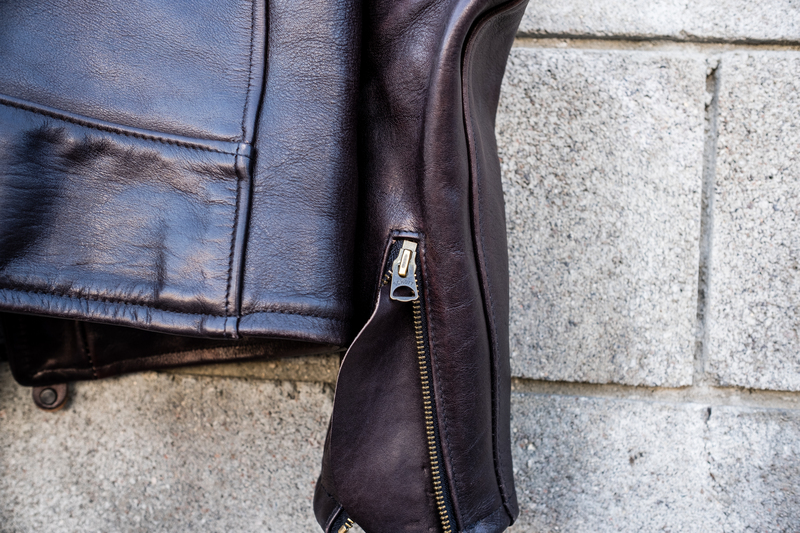 Last year, 3sixteen collaborated with Schott NYC to create a monochrome Perfecto. Two great brands that I love came together to design a limited piece that would embody aesthetics from both brands. When last year’s collaboration was announced, I had already owned a Schott NYC 519 Perfecto in Black. The monochrome detail and removal of the belt did not attract me. I initially purchased my Schott 519 because it included contrasting buttons, one star shoulder epaulets, and a flashy belt. To me, that was the epitome of a Perfecto. You buy a Perfecto because you want the Perfecto details. I was able to try on last year’s collab at Schott NYC at the Americana in a size L (I wear a size M in the 519), and wasn’t impressed with it. The details from the 3sixteen aesthetic included a chambray lining and perhaps the removal of the belt for a cleaner silhouette. The leather appeared very matte, and I was pretty content with my 519 purchase earlier that year. 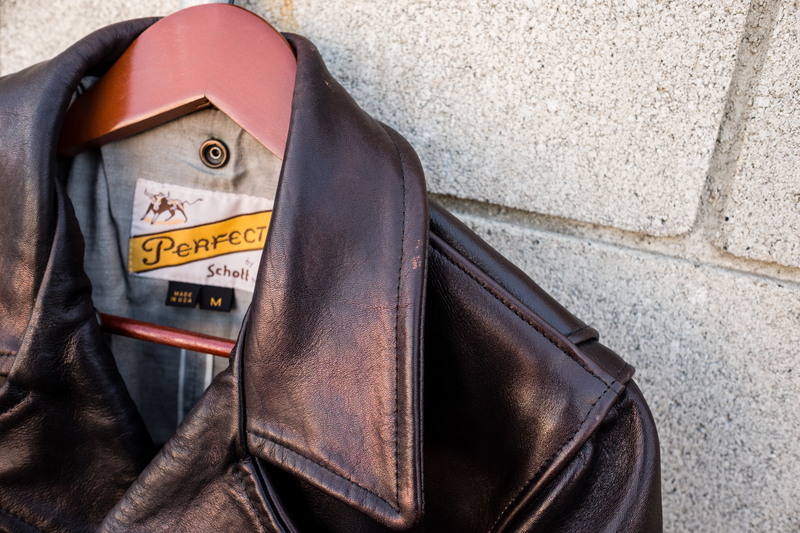 A few months ago 3sixteen revealed that they were collaborating with Schott NYC for the second time. I was pretty surprised myself as I thought last year’s was a one time only thing. I found news of this information on 3sixteen’s instagram with a closeup shot of a brass button and dark brown leather. 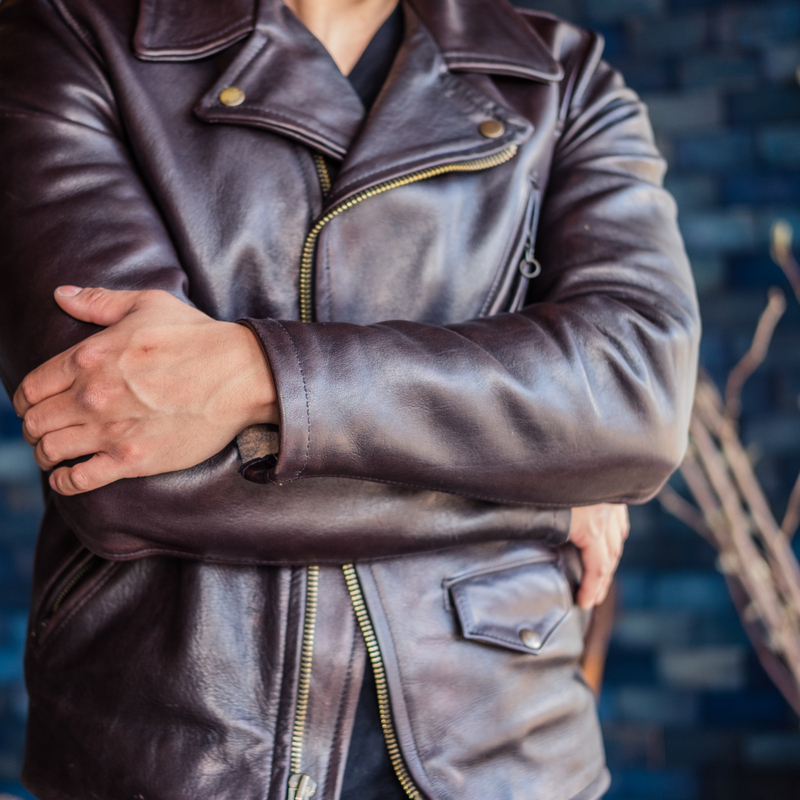 Again this year, Milo Ventimiglia modeled the jacket, and 3sixteen revealed in that post that Horween leather was used in this year’s collaboration. 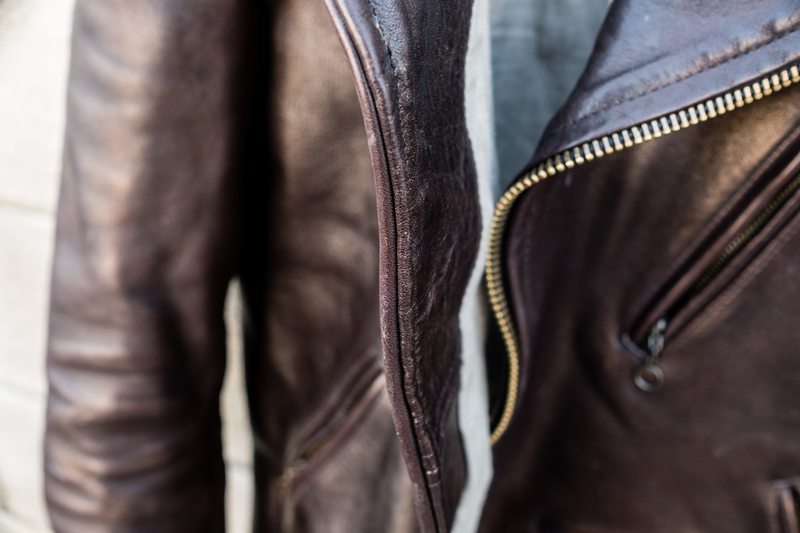 I was drawn towards the detail that this leather was “custom tanned” for this collaboration and had a “sugary surface” that would chip off with time. Y’all know that I love things that “get better with age”. The price this year was at a premium of $1100 USD instead of the previous year’s $950. The extra 150$ was likely due to adding in another company, Horween leather, a term that most fanboys, including myself, would drool to. The snap cap this year was still produced by Good Art HLYWD, but in an aged brass. 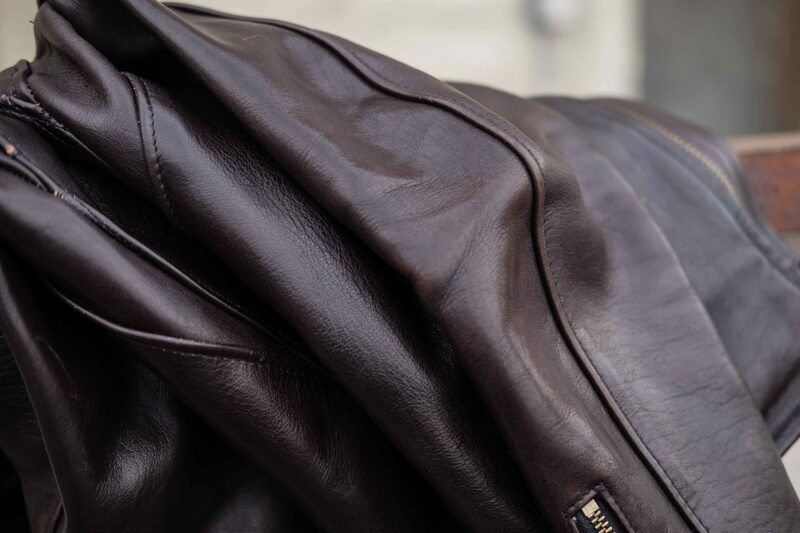 Because this leather was custom tanned, no one knew anything how it would age/patina! I was drawn to this year’s version because the piece was in a dark brown, and would actually develop a patina instead of last year’s black, which essentially stays black. I love that aged brass hardware this year was used instead of black, which complimented the dark brown leather. I took attention to what retailers were stocking this piece on the day of release, December 20th, and prepared my game plan. I had called Schott NYC LA in Los Angeles a few days earlier asking about the anticipated release. Dandee, one of the store co-managers, told me that they were receiving only one of each size from S-XL and was emphasized by Jason Schott and 3sixteen that no phone orders or reservations this year would be taken and for it. The jackets were to be sold in store only starting at 11AM PST on Dec 20th. From my past interactions, the Schott NYC LA team has great customer service, they are chill dudes that are down to earth, and they don’t pressure you to buy anything if you visit their store. My girlfriend and I had long beforehand planned a roadtrip to Sequoia National Park on the same day, but I told her that I really wanted to pick this limited piece up. I arrived at Schott NYC on La Brea at about 10:50am on 12/20 Wednesday. The two employees were already inside, but the outer gates were still locked. At 11:00am, they opened the security gates and welcomed me in. Five of the Perfectos were hanging on the front rack – one of each from a size XS, S, M, L, and XL. I was pretty confident that M was my size, tried it on. The phones were already ringing non-stop about the jacket. One phone call I overhead was a guy wanting to buy the jacket, but wouldn’t be able to pick it up in person for 2 weeks. Pretty shady stuff haha. 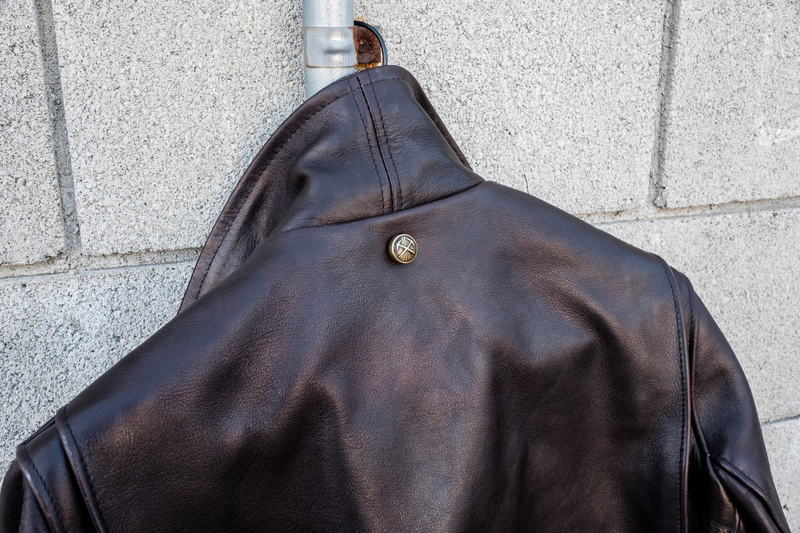 The brass snap button was initially wrapped in one of the hand warmer zipped pockets, and the guys recommended I place it on the jacket so I wouldn’t lose it. A couple minutes later, I walked out with a new jacket. 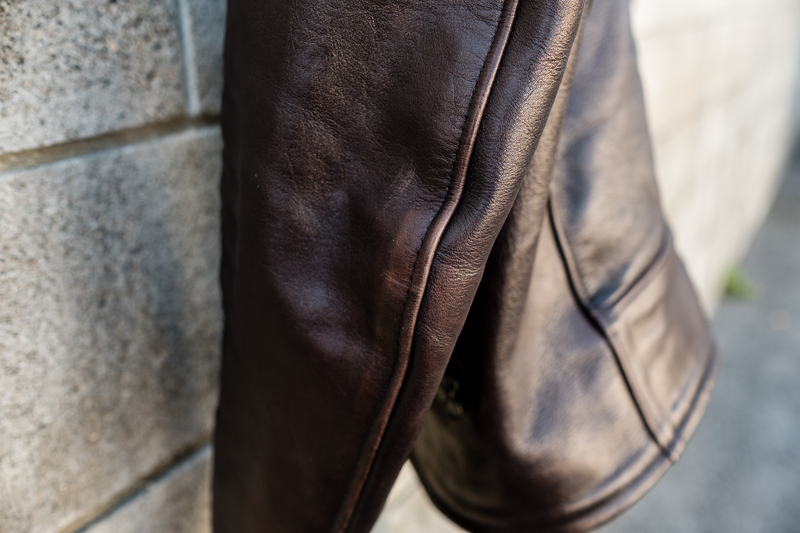 The overwhelming leather scent is hard to describe. It’s not a typical leather smell I’m familiar with. 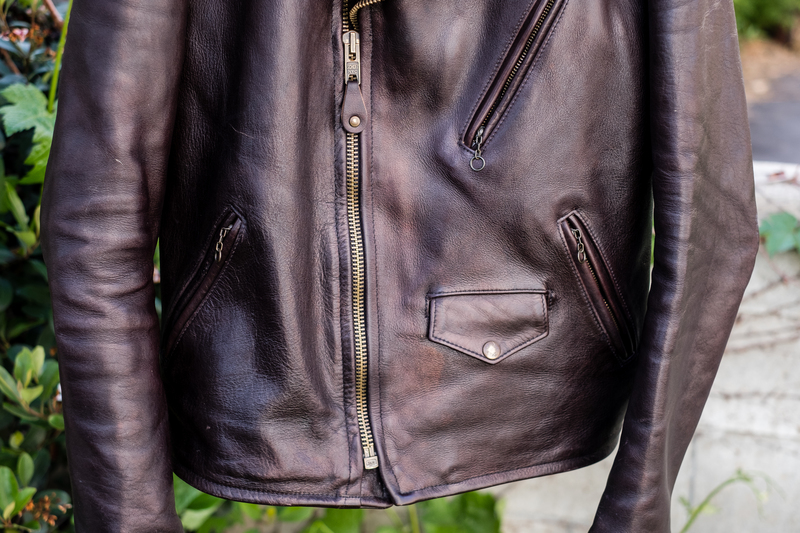 It’s neither pleasant nor unpleasant… it just smells of “Horween leather”. It wasn’t until a few days later when I returned from Sequoia National Park that I was able to really try on the jacket. It was super heavyweight and stiff, arms and body length a bit longer than my 519. I felt that the aged brass really complimented the dark brown color well. In my attempt to break the jacket in, I wore it whenever I was in my room. The arm and body creases started to form, and once that happened, the sleeve and body length became perfect. 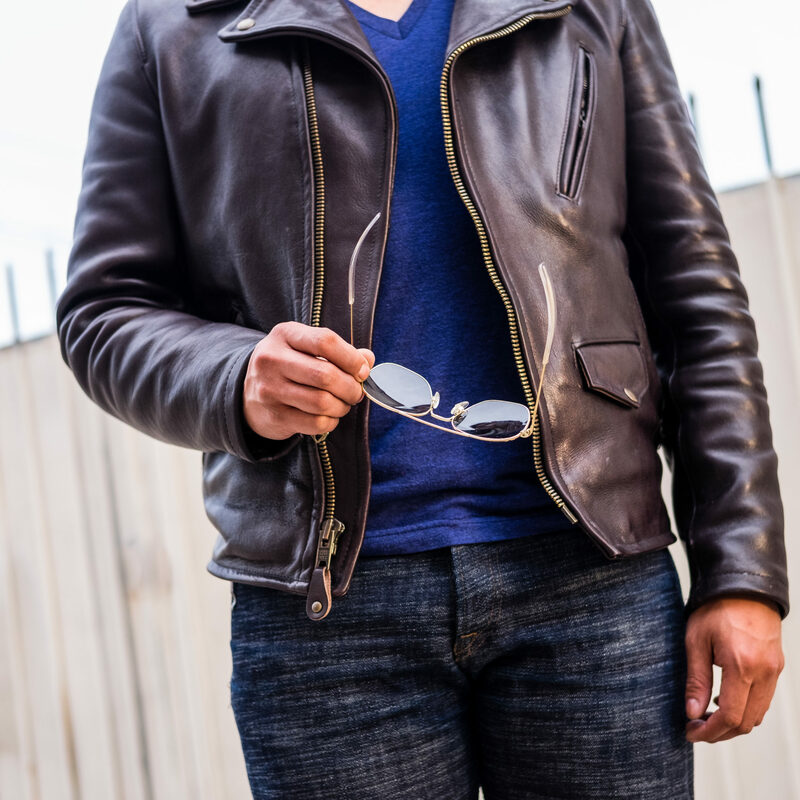 The major differences from the Schott 519 in Pebbled Cowhide is that it’s a heavier weight, no belt (I like this because the belt often flailed around) and epaulets, a deep pistol pocket (great for sunglasses and my phone), and a lightweight, breathable chambray lining instead of quilted polyfill. It’s been just under 4 weeks since I purchased this jacket, and it has become much softer and cozier. 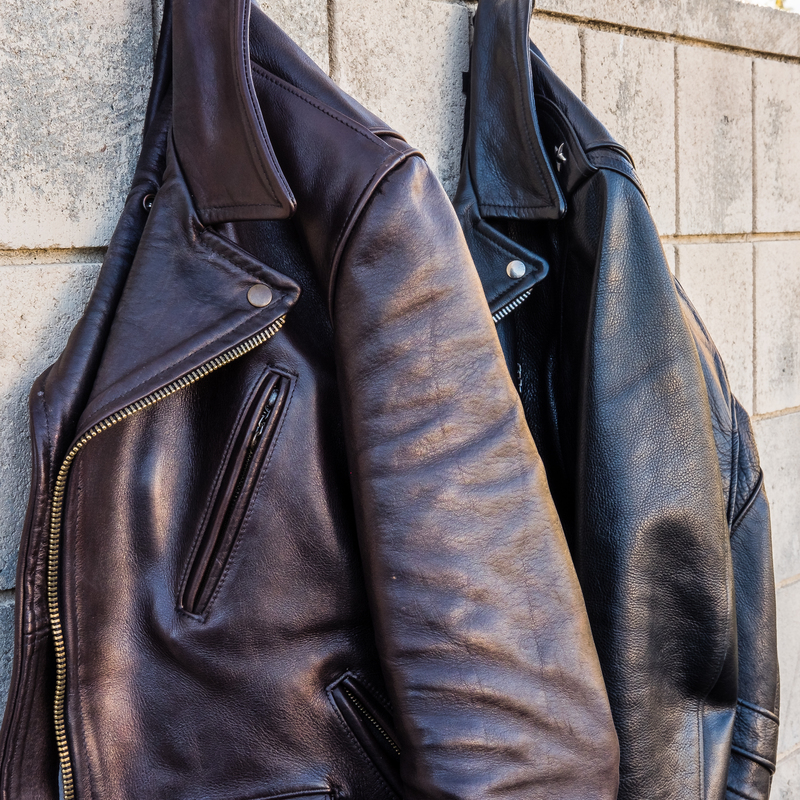 The leather has lightened up in some areas such as the elbows and back. I look forward to how the unique leather will age! After 5 months or so, the Perfecto still has a strong smell to it after purposely leaving it in the backseat of my car for several weeks. 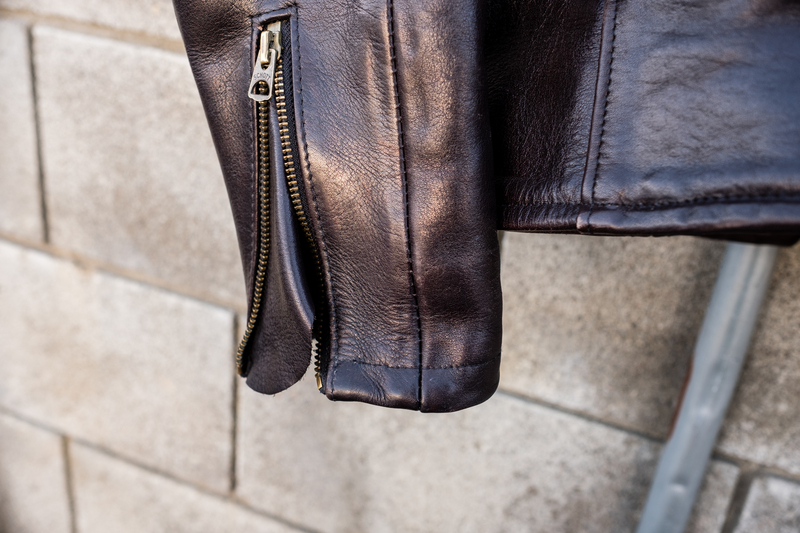 Two major areas on the jacket have changed colors – the elbows and the near front placket. The elbows have lightened up from a dark brown to a lighter brown from abrasion on surfaces. This will likely be the color the jacket will lighten up to after many more years of wear. Oddly, areas on the front placket and especially the collar have become polychromatic when viewed in direct lighting. At first, the rainbow sheen appeared around the collar so I thought it was from my sunscreen. However, shortly after the irregularity spread further down the placket in random areas. I think the cause of this color change is the pigment breaking down from age. It’s not very noticable unless viewed in direct lighting from the sun. Also, the color change doesn’t seem to be accelerated by sunlight/UV light as they appear irregularly on the jacket. As the weather warms up in Southern California towards late spring and the start of summer, I find myself not wearing the jacket as much. I purchased the Railcar Fine Goods Chore Coat on November 25th, 2017, after seeing fit pics of Taylor (of Railcar) on her Instagram. After asking Aun for other chore coat recommendations, I chose this chore coat because of their petite (XS) size and “not so boyish” look. I was in between the Apolis Chore Coat (Aun’s review here), but decided that I could always borrow his coat. Railcar Fine Goods is an extremely local business to myself and Aun, which made this product even more appealing when deciding which item to purchase. This unisex Duck Canvas chore coat is made from 12 oz. American canvas fabric, cut and sewn at Railcar Fine Good’s workshop in Monrovia, CA. 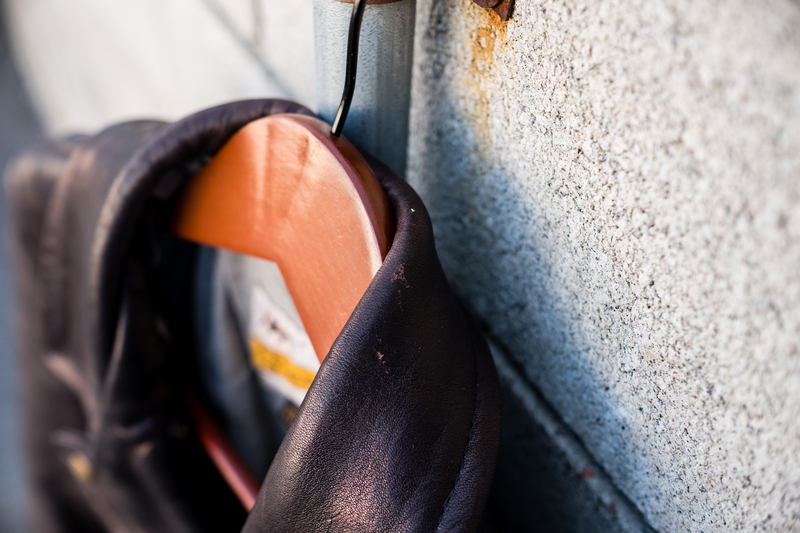 According to Railcar Fine Goods, each button and rivet was hand sewn at their workshop. There are four pockets, two breast pockets and two hip pockets. The two hip pockets are great for holding your phone and loose change. My first grade students also like sticking rocks, bracelets, and notes into those pockets. The left breast pocket appeared, in photos, to be sewn to hold pencils and other small objects , similar to my Ginew Heritage Coat. The pocket is not divided into two compartments, giving you three full pockets and one buttoned flap pocket. 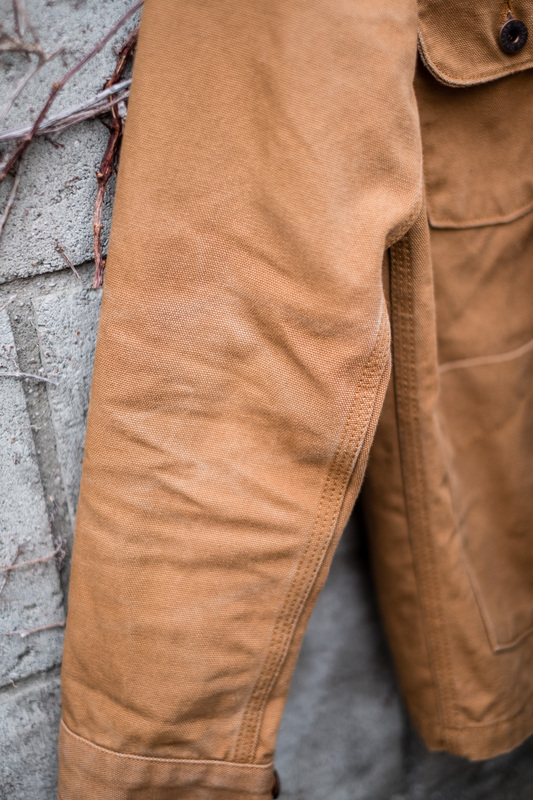 Railcar Fine Goods also has flight trousers made from the same duck canvas material, which Aun states is equally as breathable. My intial worry was that the coat would be too manly and the color too “out there” for me. I thought of different tops I could pair this jacket with to reflect various vibes. Some days I want to show a women’s workwear vibe, while others I want to be cute and girly. I have paired this chore coat with dresses and with raw denim and tops ranging from dark collared flannels and off the shoulder ruffle blouses. 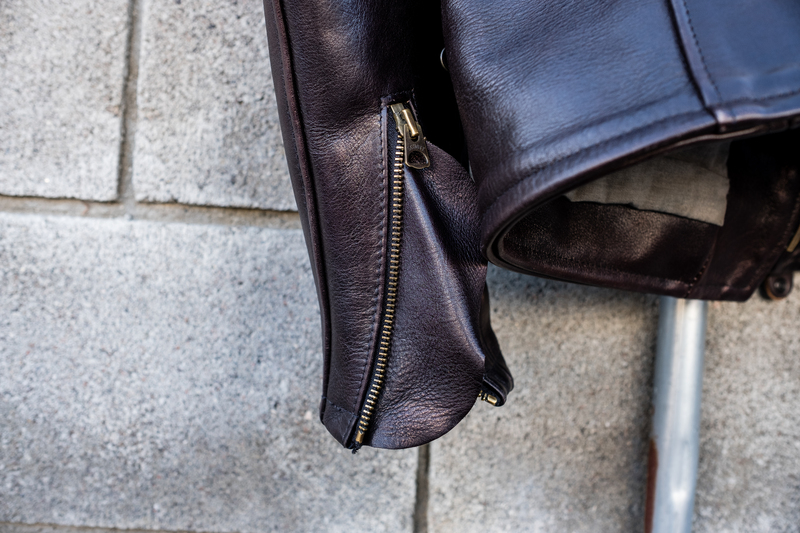 This makes the coat incredibly versatile. Duck canvas begins with stiff and rigid, but becomes softer with each wear. The jacket shrunk a bit upon doing a cold wash and hang dry. The 12 oz. 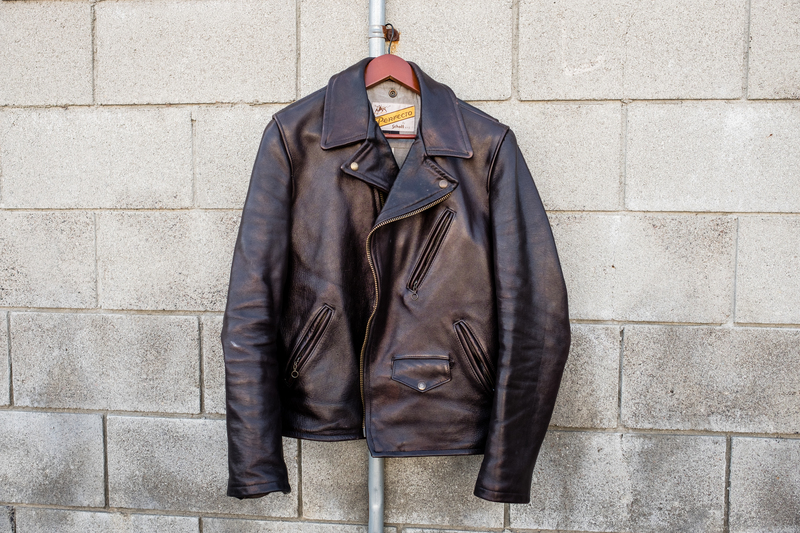 fabric is very breathable and suitable as an all year jacket here in warm Southern California. Over time, the fabric will show signs of fading, as my jacket is showing signs of fading around the arms. Also, this jacket is well-made and durable. The seams are triple stitched. 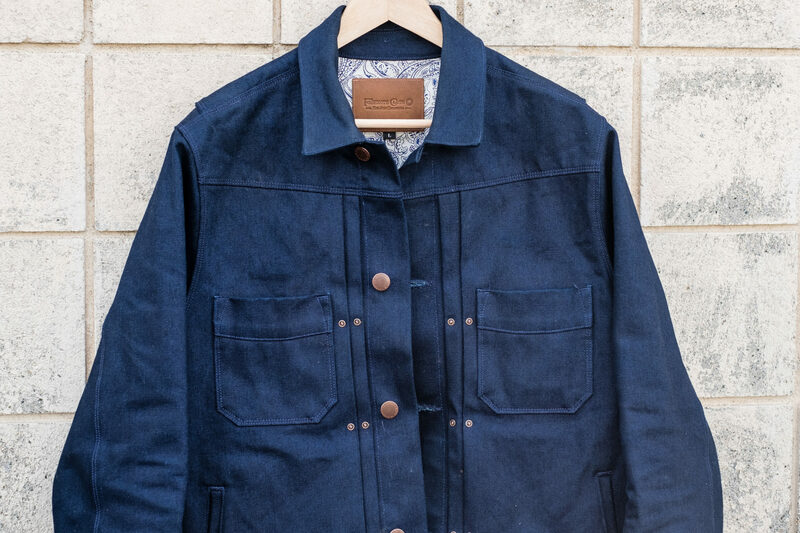 The Railcar Fine Goods Chore Coat is a great, staple jacket for those of you looking for a year round jacket and a #buyitforlife item. For women, you can wear this jacket to complement any style you wish, it doesn’t only have to be a “workwear” jacket. The caramel color is a great spring and summer color, and the added pop of color needed for the darker fall and winter hues. 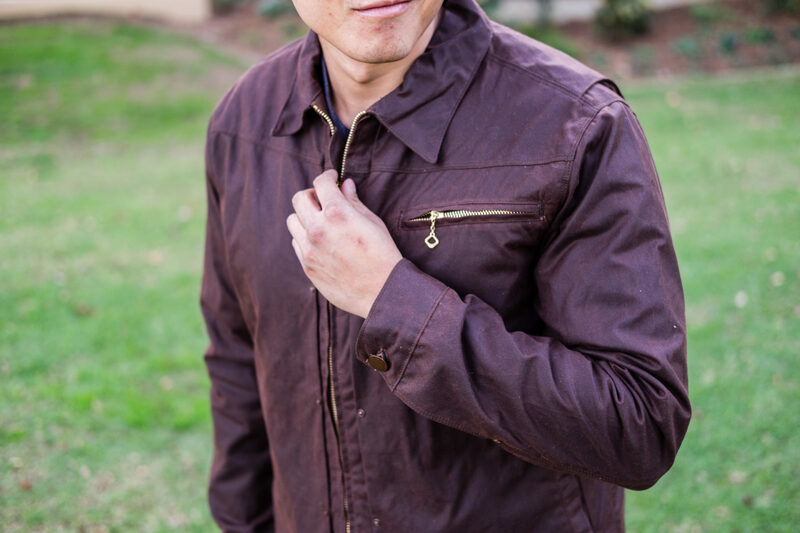 Railcar makes this jacket on-site, which is an added bonus! Within the last week, Freenote Cloth released a new spring jacket – a Indigo/Indigo 14.75oz Denim Rider’s Jacket in a very subtle manner. No Instagram or other social media posts accompanied the new product in their online store. I stopped by their flagship store in Highland Park a few days ago in the afternoon, and saw this jacket on the racks. The jacket had a dark indigo color with hues of burgundy. The liner was a cotton paisley pattern Greg (@denimhound) agreed with me that this was our favorite version of the Rider’s Jacket thus far. When I first started learning about Freenote Cloth in late 2014, I had recently missed out on their limited release Raw Flecked 14oz Rider’s Jacket. Since then, I would say that Freenote’s Rider’s Jackets, specifically the waxed canvas versions, became their staple product. Quite similar to 3sixteen’s Shadow Selvedge Type 3s Jacket (link to my review). There was perhaps one other denim Rider’s Jacket in Cone Mills denim sometime in between. 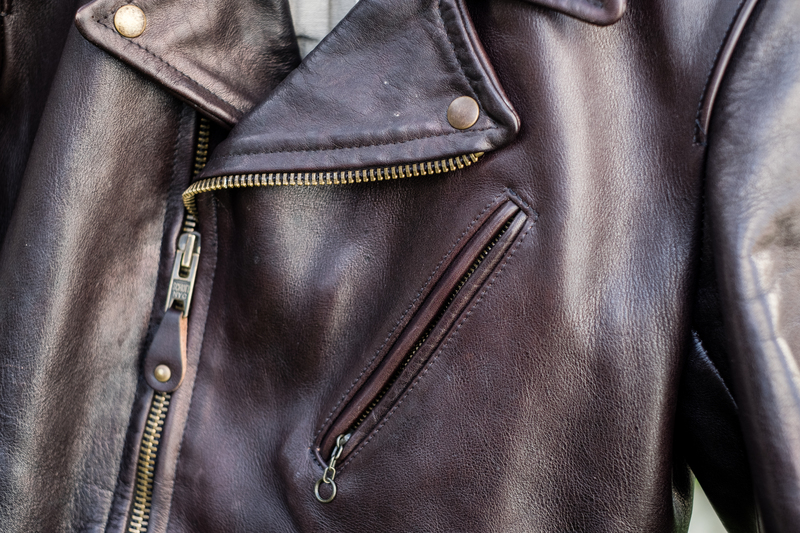 What’s cool about the Rider Jacket is that it carries features of a Type II denim jacket with the front pleats, but also adds practicality with handwarmer pockets. In my experience, Indigo/Indigo denim tends to fade in a very fast and pleasing manner with high contrasting fades. In terms of sizing, this version runs slightly larger than their past waxed canvas Rider’s Jackets. I went with the same size as my previous Freenote Cloth Rider Jackets – a size Large. It’s roomy enough to layer a thick flannel or a sweatshirt underneath and still have much mobility. 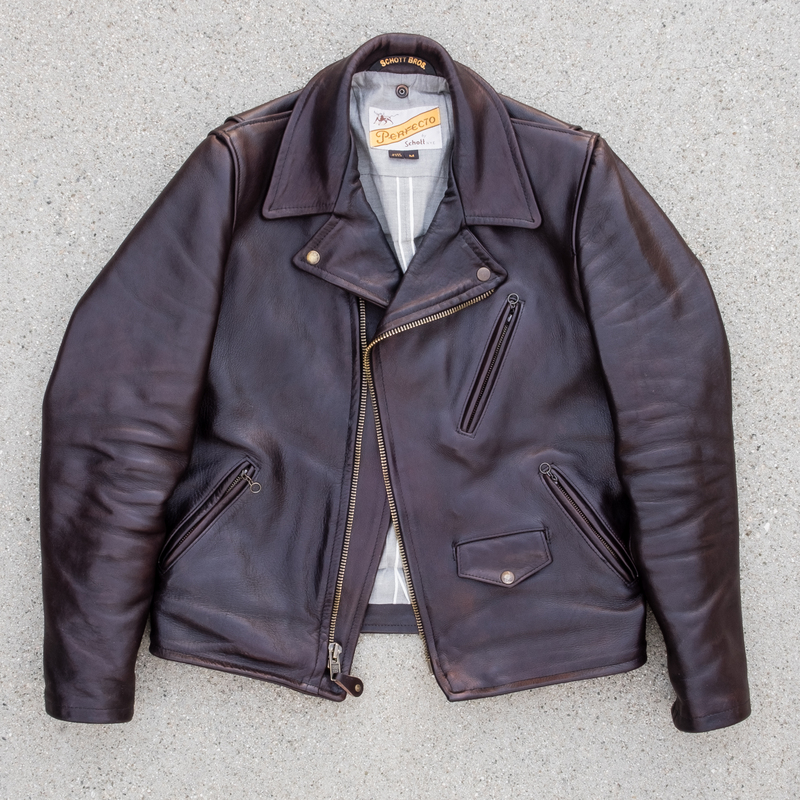 With my initial measurements to my waxed Rider jacket, this version most noticably runs 1.5 inches longer in the sleeves and at least 1 inch longer in the body length. Perhaps the difference may be attributed to the waxed cotton shrinking in wet weather. For now, I’ve decided to cuff the sleeves once upon themselves for a shorter length. In the future when I do wash it, I plan on a hot soak to shrink the fabric in all areas.. The cotton paisley lining is a wonderful pattern that I think Freenote hasn’t used before (?). Most of their Rider Jacket linings have been Chambray (for the Spring edition) or some sort of Jacquard Wool Blend (Fall/Winter). 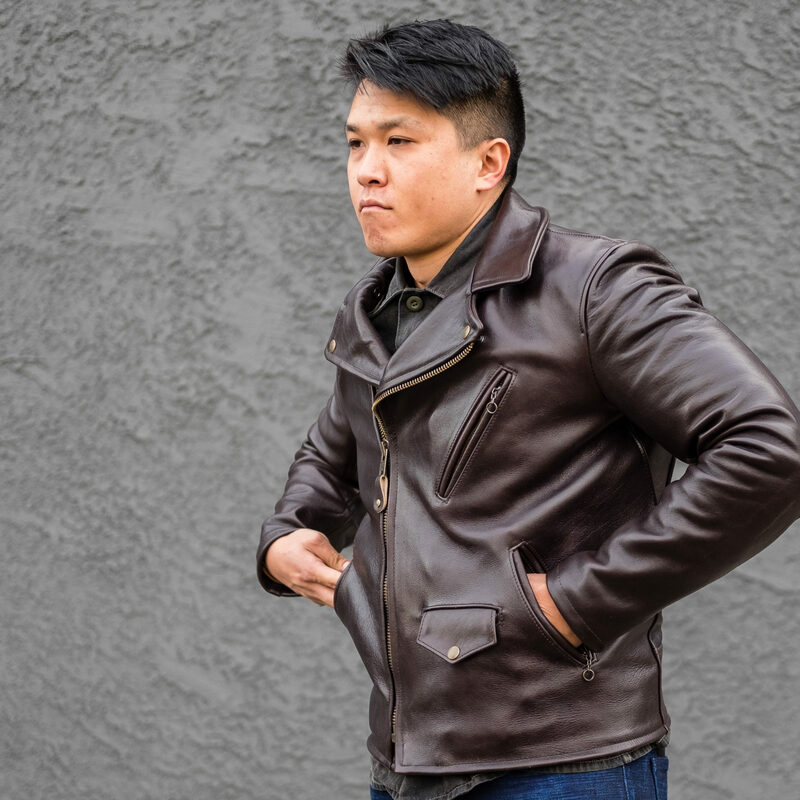 For it being a “Spring” jacket here in LA, it’s pretty darn warm compared to say the 3sixteen Type 3s Shadow Selvedge, likely because of the fabric weight plus a liner. A couple small but major tweaks that I have noticed. The chest pockets are both longer and wider which allows me to safely stash my phone (iPhone X). The front pleats are also slightly wider in diameter. The handwarmer pockets are also denim inside which increases the pockets’ durability. One major change I noticed was the large price increase. When the Raw Fleck Indigo Rider’s Jacket was released in late 2014, the price was $330. 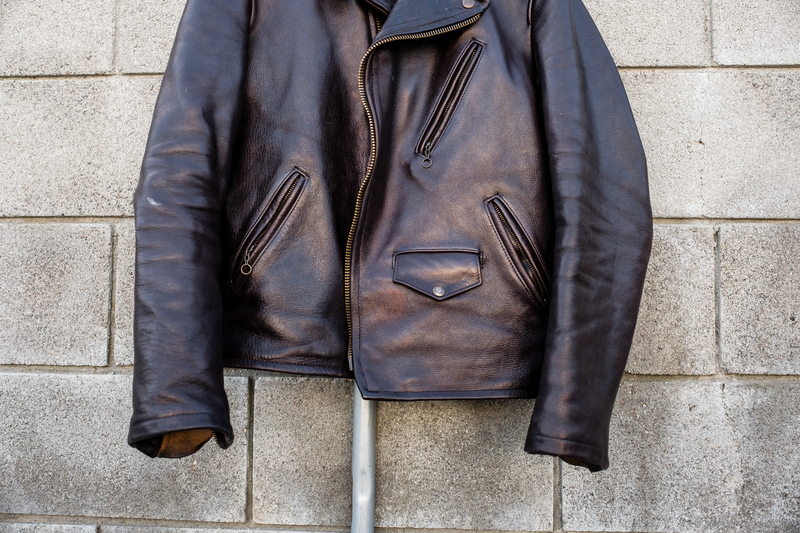 Even considering some inflation, this jacket is priced at $450 which makes it their priciest Rider Jacket to date. Many of Freenote’s products are limited edition because they use custom fabrics from Japan, and I can confidently say (after handling many other brands) that the price reflects the quality well. The measurements of my three Freenote Cloth Rider Jackets are listed here (in inches). 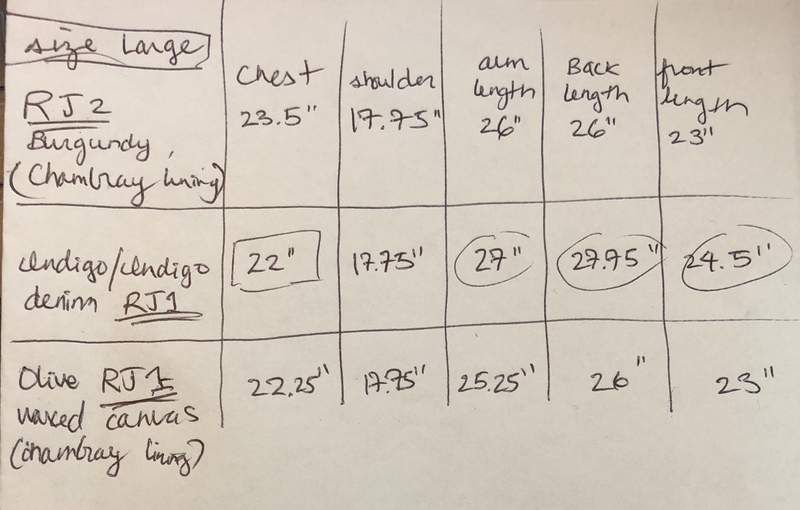 The increased body length and sleeve length of the Indigo/Indigo line up with my experience. I’m surprised that the chest “only” measures 44 inches total but that does line up with the website’s measurements! Here’s a handful of pics and fit pics for now. If you have any questions about sizing, my opinion, or anything else, feel free to shoot me a DM on Instagram (@imaunit) or leave a comment below! 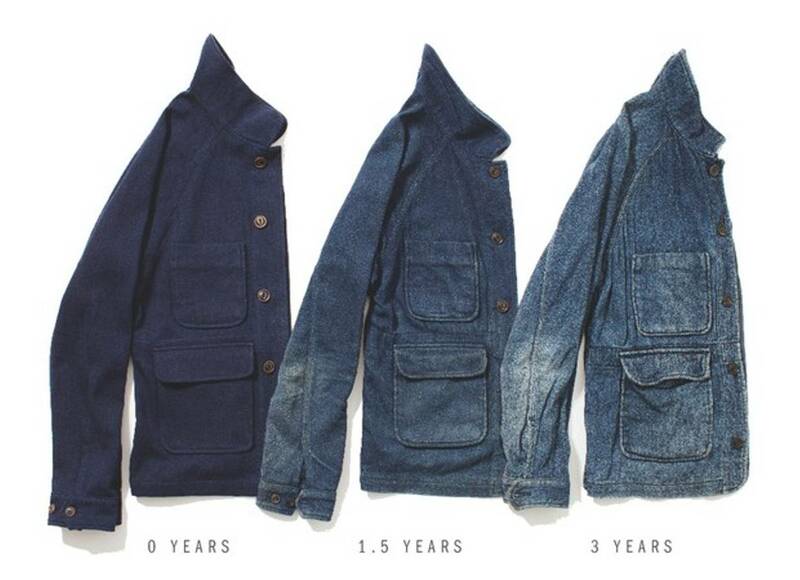 Evolution of the Apolis Chore Coat over 3 years with very very many washes. The Apolis Indigo Wool Chore Coat has been an iconic outerwear piece of this decade especially because of an awesome 3 year evolution pic. Although my own chore coat hasn’t come close to that level of fading, I still can provide insight for those considering to purchase one! 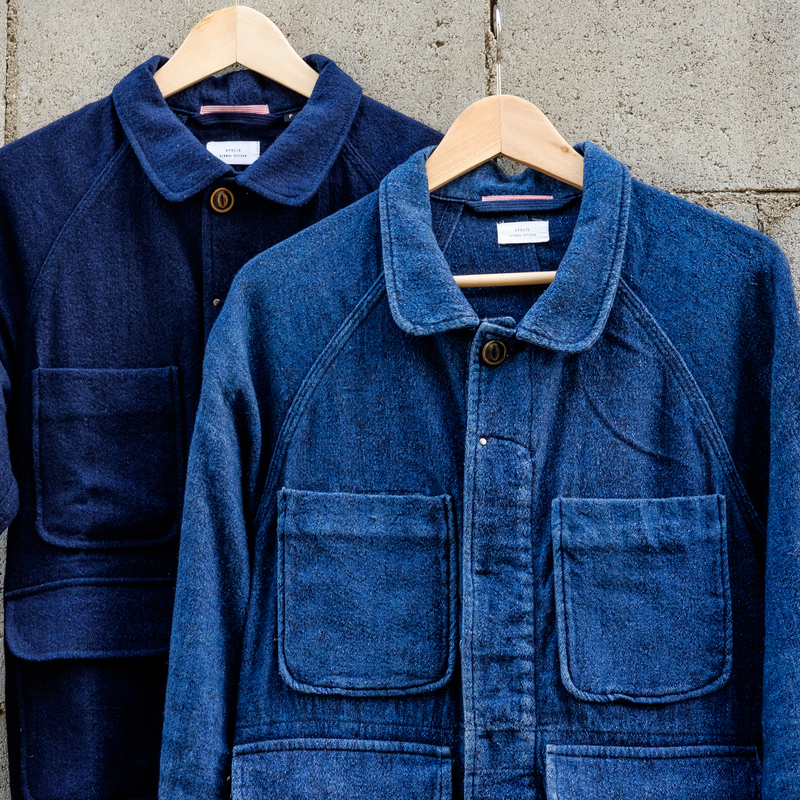 The chore coat is my favorite garment piece from Apolis, specifically the “OG” Indigo Wool version. More recently, Apolis has come out with a variety of colors for the chore coat including Olive, Charcoal, Black, Indigo Striped. Accessory-wise, I can’t help but say good things about their Market Bags (you can find my review on the bags here). 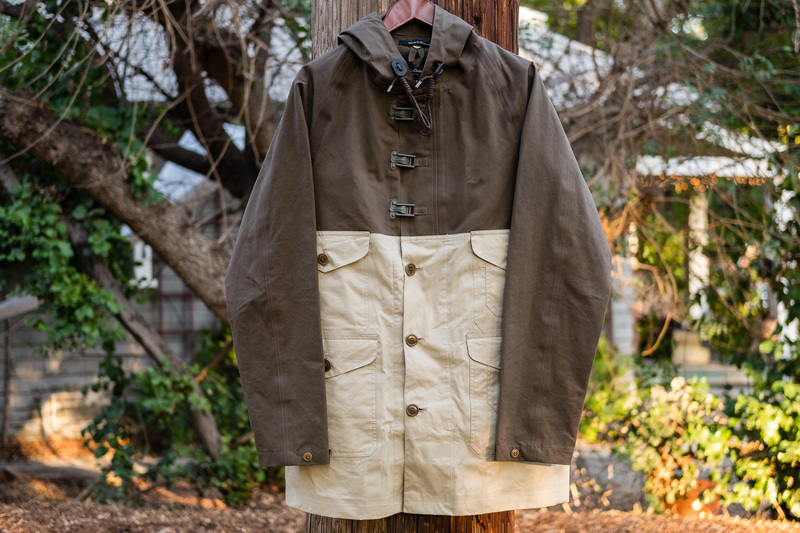 I’ve admired Nigel Cabourn’s pieces for the longest time, especially the Cameraman Jacket. The garment is inspired by a replica of the jacket worn by the cameraman Wilfrid Noyce on Sir Edmund Hilary and Tenzing Norgay’s 1953 expedition to Mount Everest. It’s essentially a combination of two vintage pieces, top being a British naval jacket with Fireman clip closures and bottom a British hunting/fishing jacket with multiple pockets. Freenote Cloth has been a low key, hidden gem brand that I recently found in the past few years. I first saw their product instore at Standard & Strange in Oakland in around 2013. Ever since I purchased my first Freenote Cloth jacket at a pop up in March 2016, I’ve really been a huge fan of their outerwear. I met Dave, one of the three owners and also the sales director, and had a real down to earth talk about the retail side of menswear. I remember hearing that vendors typically purchase wholesale at 50% of their price, so when a store has a typical sale of 15-20% off, they still make a large chunk profit even after overhead costs. When items go further down into 30-40%, likely for reasons to clear space for new items, they’re still breaking even. 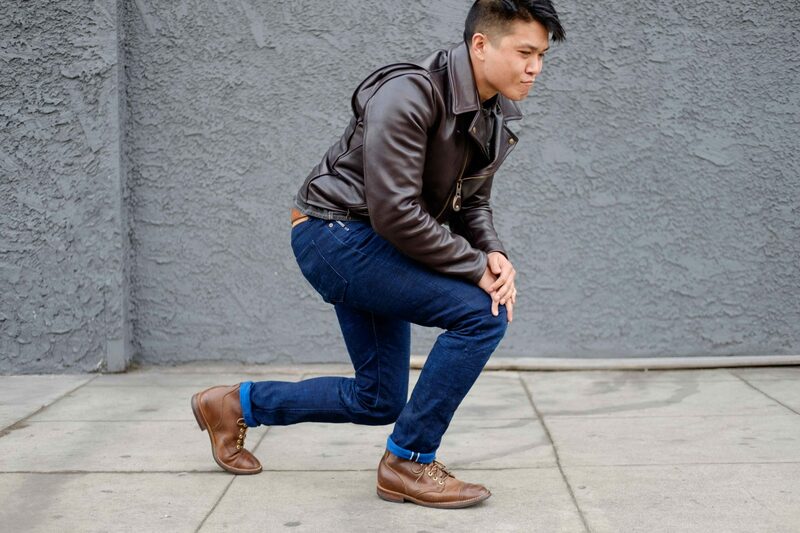 In 2014, the only 3sixteen piece I owned at the time was a pair of ST-120x in the shadow selvedge denim I had purchased and worn as my main denim since mid 2013. The shadow selvedge fades are phenomenal in their electric blue contrast. I remember purchasing the ST-120x at Self Edge SF on Valencia St in San Francisco, CA. I had set my eyes on this pair because @zvincler had a amazing faded SL-120x pair that was posted online. A few days after Thanksgiving in 2014, I had heard about Self Edge’s yearly sale where they discounted the % of the current year for all inventory. I can’t remember whether the Type 3s Shadow Selvedge jacket was released that F/W or if it was a year before that. Knowing how the same fabric faded, I decided to take purchase a size L at Self Edge LA. It was my first denim jacket with the detail of being a very dark indigo (nearly black) to start with. The price of “Black Friday’s Let’s Drink Sale” with 14% off came out to be $248.41. The shadow selvedge fabric is a very dark indigo with hues of purple. 3sixteen made a few changes from the “Type III” Trucker Jacket to make it their own. 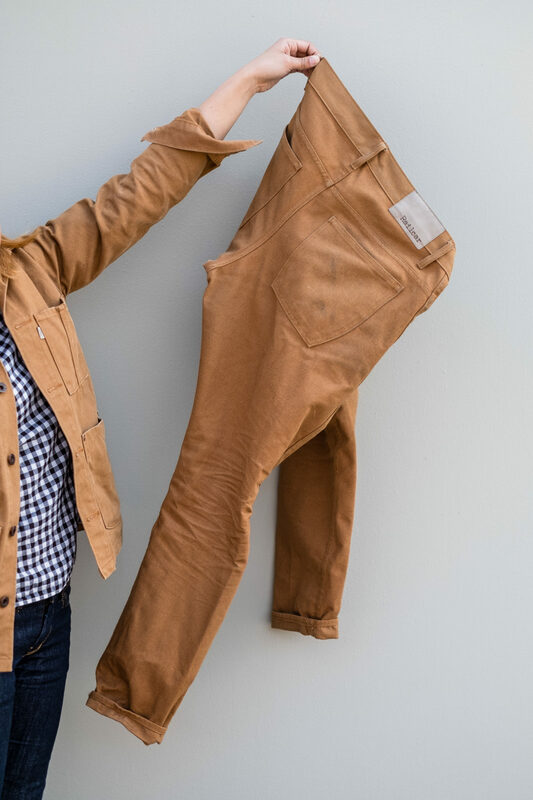 The body is slightly lengthened to make the look more modern, black corduroy lines the cuffs and pockets to make the jacket feel really comfortable, and the rear waist buttons and “cinch strap” were removed. In addition, 3sixteen added their signature crossed back yoke and zigzag stitching on the backside of the collar. The jacket runs small and I had to size up one to a Large where I typically wore Mediums shirts/outerwear (referencing Uniqlo T shirts, Button-downs, and Outerwear) at the time. When I recently measured the pit-to-pit on my Large after a few years, it came out to 21.5 inches. An issue that I found with the jacket is that the sleeves ran short and the cuff size was way too small to button. I’m a pretty average sized dude – I’m 5’10 and about 170lbs. I pretty much always have to wear the cuffs unbuttoned even with just a T shirt underneath. Adding layers like a a wrist watch or a thicker flannel makes it even moreso uncomfortable to close. The one cool detail about the jacket that I love is the “hidden” phone pocket that you can place your phone into on the inside behind the handwarmer pocket. The top chest pockets are too small to fit a phone without sticking out. Chest pockets too small for a phone! For the first year, I wore it on average 3-4 times a week. 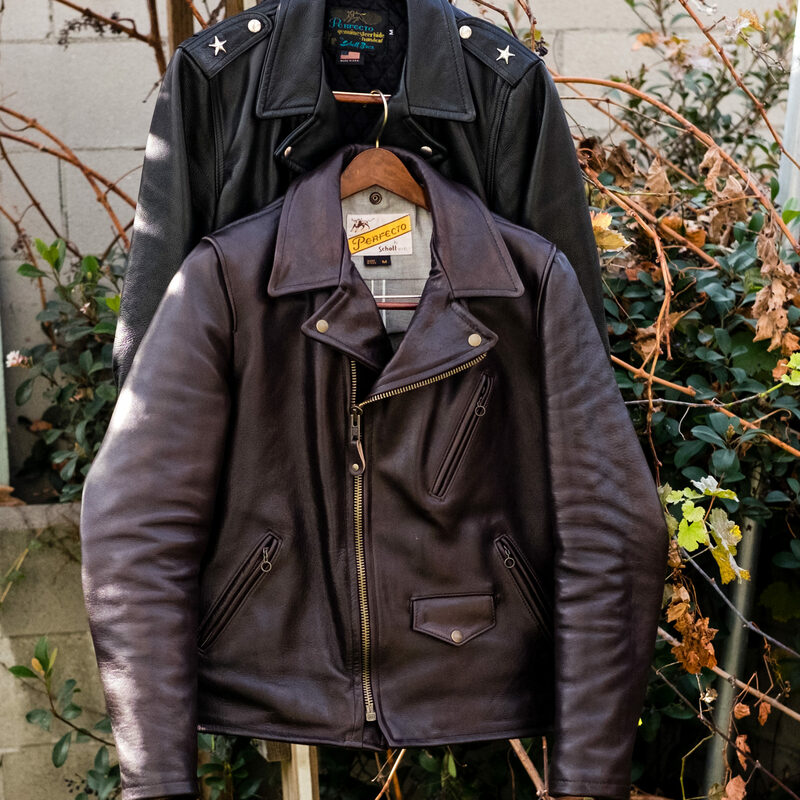 The fabric weight is great for SoCal – It’s a great jacket by itself anytime it’s 65-75 degrees, and maybe slightly lower if you pair it with a thick flannel. 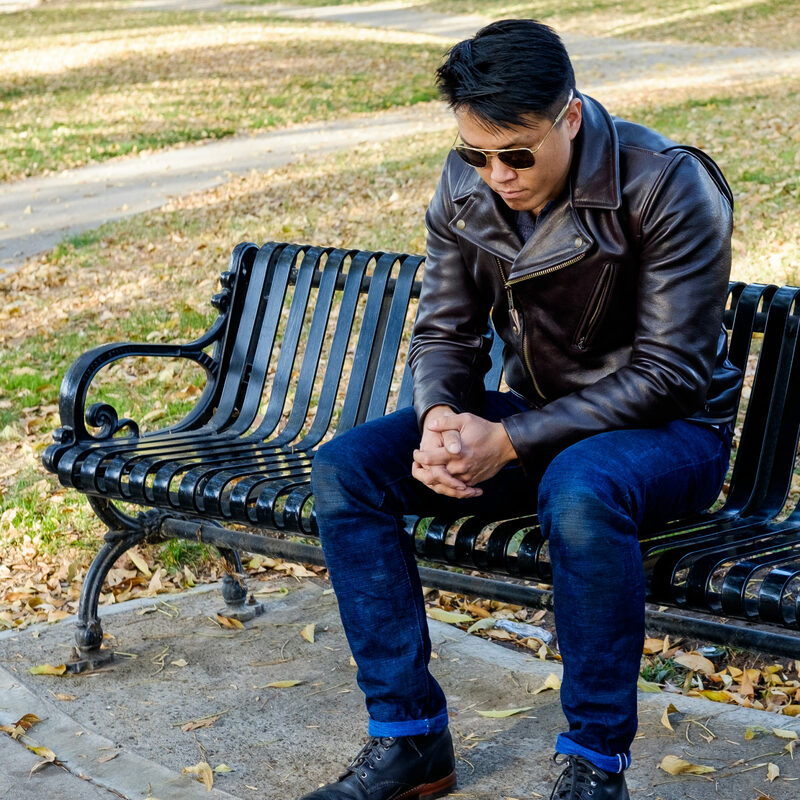 For a short while after purchasing the jacket, I wore both the shadow selvedge 120x denim and the jacket! Aka the “Shadow Selvedge Tuxedo”. I think I was comfortable pairing the both together because my jeans were quite faded already and top/bottom were different colors enough. Quite a few people have asked how how many times I’ve washed it and by what method. I waited about 4-5 months until I first washed it, never soaked it. I use the washing machine on a cold wash with a small amount of Woolite Darks to minimize the indigo loss and then line dry. The first time when I finally washed it, much of the contrast was revealed. The jacket shortened about an inch in the sleeve length, body length, and chest circumference. Owning it now for 3+ years, I may have washed it a of 12 times but lost count. 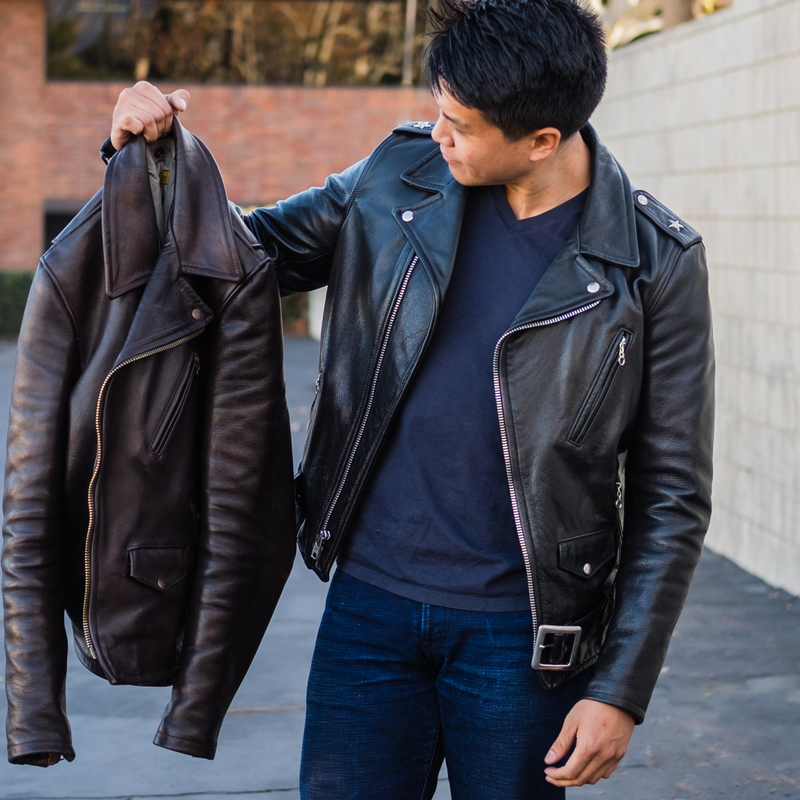 Also shortly after my first wash, I was contacted by Andrew Chen and featured on 3sixteen’s Well Aged Type 3s Jacket! I’d say the Type 3s jacket was one of my best outerwear purchases. At the current retail value of $265, it’s worth purchasing if you had to own only 1 denim jacket for the rest of your life. The shadow selvedge fabric is unique enough to recognize someone else wearing it as I have a couple times in downtown LA. 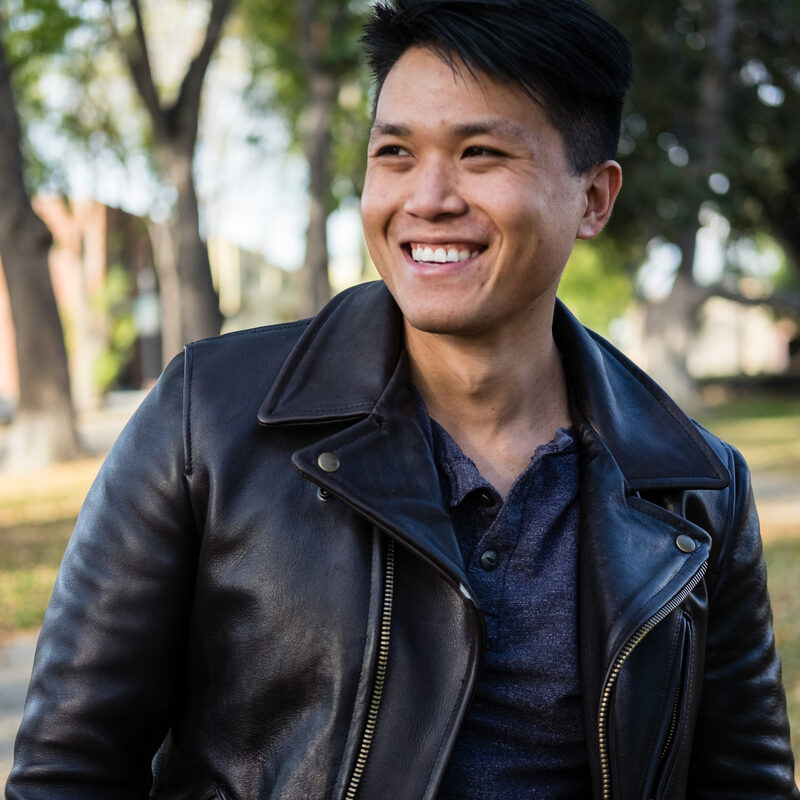 The jacket was likely also my gateway purchase into pricier jackets such as 3sixteen’s FW releases in the coming years. 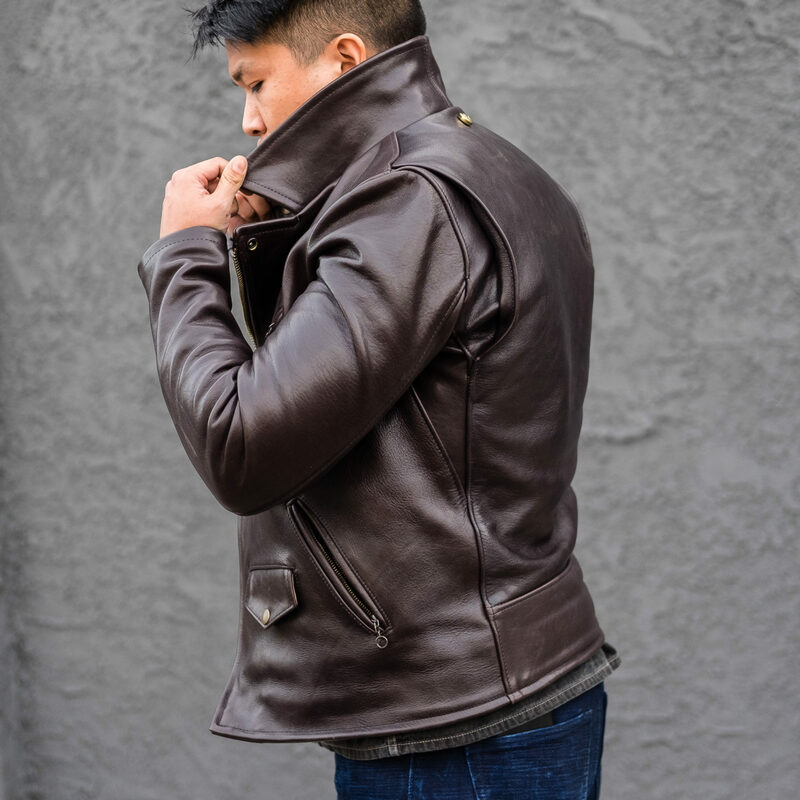 Now that many other denim competitors have joined the market, I actually think 3sixteen’s expansion over the years was due to their outerwear starting with this jacket’s release. It’s now a staple item for their site and retailers and very rarely, if ever, goes on sale.